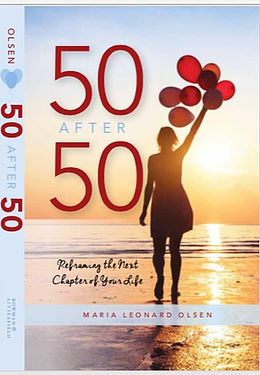 Meet Maria Olsen author of, 50 After 50--Reframing the Next Chapter of Your Life on September 8th from 12:30pm-2:30pm! Olsen is an attorney, a cohost of DC's "Inside Out" radio show on WPFW fm 89.3, a women’s writing and empowerment-retreat leader and diversity speaker, and a woman who turned fifty expecting to find life less satisfying. But while her children didn’t need her as acutely and many of her other relationships had also changed, by setting out to accomplish fifty specific things, she discovered that the key to a meaningful life was still within her power. Her chosen goals ranged from physical challenges and travel to lifestyle changes, and the project revitalized her life. As she recounts how she selected and pursued her fifty activities, readers will be inspired to choose their own set of objectives for the next stage of life.